President Bush today, responding to Iraqi demands that private security force Blackwater USA be withdrawn from Iraq, immediately proposed a "surge" in Blackwater personnel to deal with the problem. "Although keeping Blackwater in Iraq may lead to an increase in violence," said Bush, "we have to keep Blackwater there in order to contain the violence." Iraqis were irate about a recent incident in which Blackwater mercenaries allegedly gunned down Iraqi civilians without provocation. "We're investigating that," Bush told reporters, adding that Blackwater may have been justified in "preemptively attacking" the civilians. A New York Times article published today revealed that Blackwater employees have an "aggressive, quick draw image" and have been involved in many more shootings than any other mercenary force the U.S. has brought into Iraq. President Bush today acknowledged that Blackwater USA did indeed fire their weapons far more often than others, but observed, "That just means they're happy." Bush said that there were plans to withdraw private security forces, such as Blackwater, from Iraq as soon as Iraq was able to train and maintain private mercenaries of their own. Foreign analyst Miles Becker agreed with Bush that the presence of Blackwater was helping to create private Iraqi military forces. "They're called insurgents," said Becker. 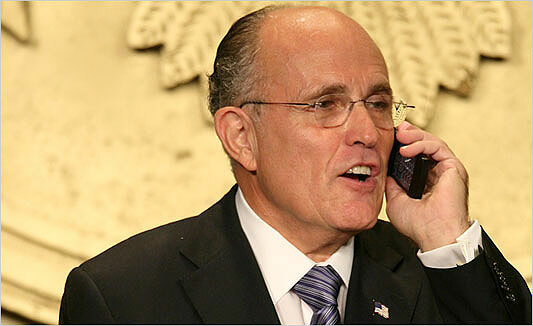 President Giuliani Responds To Fiscal Cris-- Excuse Me. Hello? In an emergency order designed to "keep government running" for at least "a few more days", Giuliani cut taxes completely in order to dramatically raise revenue. "Eliminating taxes is the only measure that will provide the government with enough of an increase in income to keep afloat," Giuliani said in a nationwide address before taking a call from his tailor, who had some questions about an inseam. After U.S.-Sponsored Tour, Couric Says Hindenberg "Totally Safe", Pronounces Titanic "Unsinkable"
Surprise Visit By Bush Scares "Bejesus" Out Of U.S. Soldiers, Gives Them "The Dickens"